North Korea released video of a submarine missile launch on Friday. The North Korean regime released video Friday of a “successful test” of a submarine-launched missile. ** Pyongyang announced a successful hydrogen bomb test last week. North Korea continued to goad the international community with footage of what it says was a fresh and more successful test of a submarine-launched ballistic missile. The new claim came amid growing tensions after the North tested another nuclear device last Wednesday. State-run [North] Korean Central TV on Friday showed the footage as part of a propaganda segment about leader Kim Jong-un’s visit to a military unit on Dec. 21. Kim is seen in a thick coat and hat standing on the deck of a ship watching the launch. 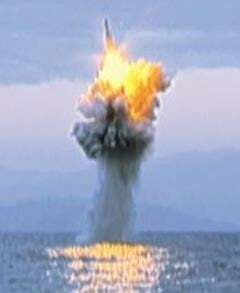 The missile rises almost vertically from the sea before the engine ignites in the air 30 to 40 m above the surface and disappears into the clouds. Some experts believe the footage was doctored, none too subtly combining clips of improved Scud missiles launched a couple of years ago. They reason that no SLBM would ignite that far out of the water.